Very fast shipping, looks and works as brand new. Thank you for an easy, pleasant transaction! Excellent seller. Super quick shipping and item came as described! Thank you so much! Great, Brand new, definitely recommended!Thanks!! This is a great watch that that easy to set up, always stays connected to my iPhone’s Bluetooth. Great variety of clock faces to choose from, tons of apps com already installed during the initial setup, love being able to set the lay out the other apps on the clock face via the phone app and have yet to get below 60% battery life at ththe end of my day . Love everything about this watch. Great Companion for iPhone Users! 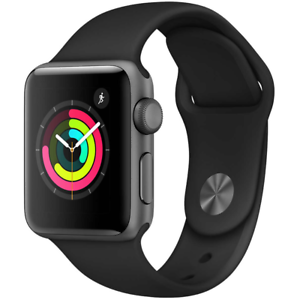 From getting your notifications and answering phone calls right on your wrist, to tracking your mile swim across a lake, the Apple Watch is one of the best phone companion devices out there. Easy to use when you get the hang of it, and plenty of features for such a small device. Battery life lasts all day on a single overnight charge, so you won’t ever need to take the watch off, even in the shower! The cellular models can even function without your iPhone present! Overall, this device is definitely worth it, think of it as a Fitbit and a iPhone combined into a single device on your wrist. Skeptical at first about spending $300 for an iPhone accessory but after I trialed the watch I found features I really appreciated. In fact I started reaching for my phone less and here's why at a summary level: Good * Notifications I can check easier lifting my watch then grabbing my phone * Receive and respond to a text without disrupting a meeting * Quick check of weather calendar events without grabbing then unlocking phone * Siri speak allows you to keep eyes on task instead of looking at watch Bad * Weather apps takes sometimes 20-30 secs to update so you may not get accurate temp (took a Star off for this as I use the Weather app a lot) * Trying to figure out which apps or parts of app support Siri where with speak In short, I thought I would return my Apple Watch after a few weeks because I just wouldn't find a benefit and instead I decided to keep as it opened up other options for use that I didn't think of. You need to trial an Apple Watch to really see its benefit. I did trial an Apple Watch Series 1 as well but purchased Series 3 because I wanted the Siri speak so I could keep my eyes focused on task and if you get a good buy, cost difference with tax and shipping can be $70. Great looking out of the box, no scratches, I knew the band was way too small so I had purchased am XXL band. Weird at first having something tell me to get up, but now it’s not bad, love the phone function and texting I never miss a text now. The mic is very sensitive which is a good thing. For the price it was totally worth what I paid for it. Thanks.